Arapawa Island sits at the top of the South Island of New Zealand. It is rich in history, much of which dates back to pre-European times, and many interesting events have taken place within the deep forests and wild places still to be found on the island. My late husband, Walter, and I arrived in New Zealand in 1969 and in 1972 moved to the island and embarked upon an adventure involving the wildlife of Arapawa that was to lead us on an incredible journey spanning several decades. Within the forests there dwelled some beautiful goats, sheep and pigs, all of ancient lineage and all condemned to extermination. The edict had been sounded that they were to be shot, but somehow I just could not let this happen. The goats held an immediate attraction for me because of their beauty and intelligence and I had come to know the family groups as I walked the paths carved into the hillsides over the years by the trekkings of the wildlife. The dark-eyed wild sheep, so wary and aloof, were less visible than the goats, preferring to slip away into the shadows and I came to know them only slowly. I encountered the wild pigs with some trepidation, having heard tales of their ferocity, but they left me to my wanderings, and I left them to theirs. The battle to protect the wildlife of Arapawa Island has now entered its 33rd year, many of these years wet with tears of frustration as we sought to protect and save the animals, yet also aglow with the joys of special friendships forged as, one by one, people heard the call of the Arapawa wildlife and gave of their hearts and minds to help them. Walter and I established a sanctuary for the animals that encompasses 300 acres and it is here that they all find safety and peace. 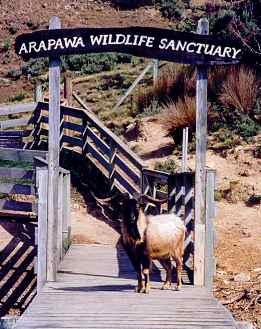 The Arapawa Wildlife Sanctuary is now home to about 100 of the animals that are recognised as being globally endangered. Visitors come from all over the world to see and admire these ancient breeds. We endeavour to teach the principle of species preservation to the many who come here. Arapawa goats "Miracle" and her son "Merlin" prance down to the jetty to greet school children, senior citizens or old friends All are immediately enchanted by their stunning beauty and capricious personalities. The demands of running a sanctuary are many. Aside from the many visitors, there are the day-to-day chores of cleaning the sheds where the animals sleep, feeding, watering, and sometimes looking after orphaned babies or caring for an unwell animal. I am in my 74th year and although I am still strong and fit, I must begin to think ahead. Walter passed on two years ago, and I now look to others to carry on the work he and I began so many years ago. 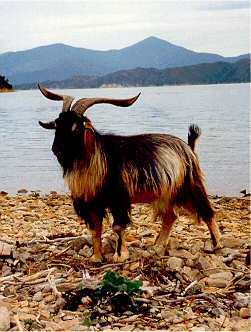 Arapawa Goats are now living in the United States and England where they are cared for with love and respect. For this I am most grateful. The message of the Arapawa Wildlife must be to sound the alarm for endangered species around the world and to bring the message of species conservation to all who will listen. This is what we endeavour to do here at the Sanctuary. To those who have heard the call and brought the Arapawas into their lives, I say a grateful thank you.